Hi Peter - I'm wondering if you could get me started on identifying this vase. It stands about 46cm tall (about 18 inches). 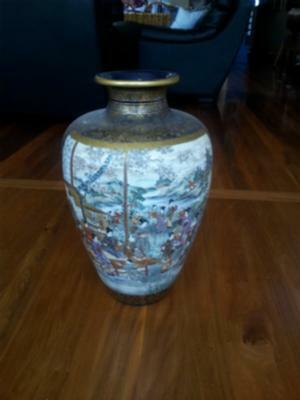 I have seen Chinese Imari vases that look a bit similar to this, but I haven't seen the same artwork. Sorry, I've just noticed the duplicate photos. I can send the photo of the other side if that helps. Thanks!! Kind regards, Geoff. Thanks Peter - yes, I think you are right. Thank you so much for your help. It looks like a Satsuma vase, now that I have seen other pictures. My suspicion is that it's a copy - apparently Satsuma vases have Japanese writing on the bottom, and the absence of that leads to the likelihood that it's not a genuine one. That's what I read in my online search. If it does turn out to be genuine, it will have a value of several thousand dollars. Your help is much appreciated. Kind regards, Geoff. The picture is a bit too small to see any details. But the shape is not Chinese. In addition, the people (that are too small to see details of) seem to be ladies in Kimono. All this points to a Japanese item. It might be of advantage if you could upload one or two closeup (partial) pictures in a separate submission? A picture of the bottom might also help. From the bit I know about Japanese wares, I wonder if this could be a Satsuma vase? Maybe someone else can confirm this or suggest what else this could be.